I tried paneer sandwich recipe for the first time using homemade paneer for our breakfast .I referred few websites and came up with my own combination.We all liked it very much.More than us,Raksha enjoyed it a lot.The combination of paneer masala,green chutney and tomato sauce with bread was yummy.Its a simple yet filling breakfast recipe for kids as well as adults.It can be packed for lunch box too.I made few colourful open sandwich to serve my daughter.It was more appealing . Crumble paneer cubes into small pieces.Set aside.Grind green chutney with the ingredients given above and keep aside. In a pan,heat oil and splutter cumin seeds.Saute onions.G&G paste.Mix well till raw smell leaves off.Now add the crumbled paneer,red chilli powder,turmeric powder & Garam masala powder.Add the required salt and mix well.Saute till u get a nice smell.Lastly add kasoori methi,give a toss and switch off the flame.Garnish with coriander leaves. 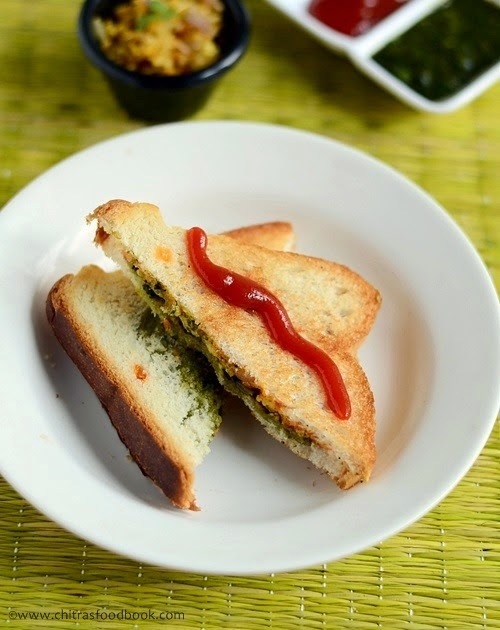 Now take one bread slice and apply green chutney on one side.Toast the other side for few seconds adding butter or ghee.Remove in a plate.Take another slice of bread and apply tomato sauce on it.Toast the other side with ghee or butter or oil.Now spread the paneer masala on top of tomato sauce bread.cover it with green chutney bread and toast both the sides for few seconds till u get browned top. Remove & cut it diagonally. U can replace tomato sauce with red garlic chutney & make it more spicy. U can also remove the corners of bread slices if needed.But i dint remove as my bread slices were very small. U can also do the grill & make a grill sandwich. Paneer sandwich with tomato sauce tastes yummy.Do try it for ur kids ! This sandwich looks simply prefect for me, filling and calicum rich as well. Perfect yummy sandwich for kids!